• Choice of battery powered, dual power or hardwired models. • Fossil fuel or electric heat compatible. • 60% larger LCD with backlight. • Permanent program retention during power loss. • Configuration menu allows keypad selection of options. • Selectable Celsius or Fahrenheit temperature display. • Selectable Energy Management Recovery (1F80-240/1F80-241/1F80-361/1 F81-261/1F82-261). 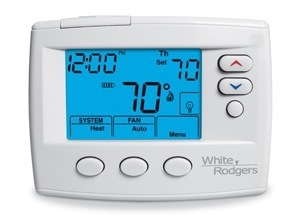 • Meets Energy Star specifications – all programmable models, except 1F80-224. • Configurable to non-programmable 1F80-0471. • 80 Series Blue fits vertical or horizontal junction box. Operating Humidity . . . . . . . . . . . . . . . . . . . 90% non-condensing max.